A Scripture lesson by a mysterious Stranger on a dusty road prepares two disciples to recognize the Risen Jesus in the breaking of bread; what did they learn? Isn’t it interesting that when Jesus appeared to two “downcast” (Lk 24:17) disciples on Resurrection Day, He didn’t do the very thing that would have broken into their despair—identify Himself? Why were these men traveling away from Jerusalem? Surely it was because Jesus’ death there had deeply disappointed them. 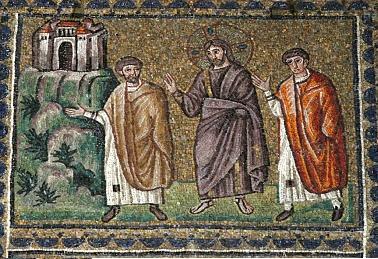 They had been “hoping that He would be the one to redeem Israel” (Lk 24:21), and that had fallen to dust and defeat. What was the point of staying in Jerusalem any longer? When Jesus appeared to them, He could have set all this right. Keeping His identity from them, however, He chose a different way. This should catch our attention immediately. If Jesus had revealed His identity, would they have been able to focus on what followed? Probably not. As it turned out, they were riveted to what He had to say; He had their full attention. He should have ours, too. What did He teach them? Beginning with the Book of Genesis, the first of the five books attributed to Moses, and then in all the rest of the Old Testament, Jesus revealed to the disciples that His horrific suffering, death, and Resurrection were part of a plan already written down, hundreds of years before. What had the appearance of terrible failure and collapse was precisely how God intended to carry out His plan. Can we imagine the impact of this lesson on the men who first heard it? They were Jews who had known the Scriptures all their lives, yet neither they nor their teachers had ever perceived that the Messiah would be God’s Son, Who would enter the glory of His reign as King of Israel through suffering. How had they missed that? Actually, it wasn’t a case of “missing.” Those Old Testament Scriptures were waiting to be revealed. Their true meaning was not clear until the Incarnation, even though they were there on the page. Until Gabriel appeared to Mary in Nazareth, they were muted, shadowy, and hidden. Jesus wanted the Emmaus disciples to see for themselves that God had not lost control of His Creation, even in the disaster they had recently experienced in Jerusalem. Sometimes this fact makes me wonder if we ourselves now read some parts of the New Testament without full understanding until Jesus returns. St. Paul does suggest as much, when he writes that now we see “through a glass darkly” (1 Cor 13:12). For example, when Jesus tells us, “Blessed are those who hunger and thirst after righteousness, for they shall be filled” (Mt 5:6), are we foolish and slow of heart to believe? What are the surprises God has in store for us as we wait for the Lord’s Second Coming? Once the Emmaus disciples had confidence in God’s plan to keep His promises, they were ready to recognize Jesus in the breaking of the bread. Here is where the Church learned that the Table of the Word prepares us for the Table of the Eucharist. The lectionary readings help us to “see” God’s plan at work through many ages and authors and events in Scripture; the Eucharist enables us to encounter God’s plan, Jesus. It was the fullness of knowledge of Jesus from both Scripture and the Eucharist that dazzled the disciples: “Were not our hearts burning within us while He spoke to us on the way and opened the Scriptures to us?” (Lk 24:32) This “holy heartburn” should be ours at every Mass. Possible Response: Father, teach me to have confidence in Your plan of goodness for Your Creation. I need to remember that You know what You’re doing. 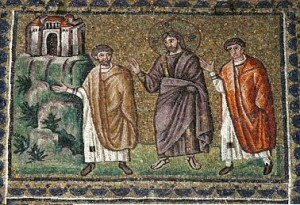 We know from the Gospel reading that Jesus wanted to drive away the sadness of the Emmaus disciples not by simply appearing to them (as He eventually did), but by showing them from Scripture that God had always had a plan for His Creation, and that He chose to use suffering (a just punishment on sin) to accomplish this plan. It should not surprise us, then, to see that on the Day of Pentecost, Peter boldly preached to the Jews of Jerusalem that Jesus’ death on the Cross came “by the set plan and foreknowledge of God” (Acts 2:23). We understood from the Gospel reading how important it was to Jesus, after His Resurrection, that His disciples understand this. While it was unfolding, the Passion looked like chaos and defeat. Afterward, Jesus taught them that it had been His victory and glory. They got it! That is why Peter could preach so confidently about God’s plan on Pentecost. He went on also to explain Psalm 16 to the crowd (and this from an uneducated fisherman!). How was Peter able to do this? Surely what Jesus began on the Emmaus road was continued with the apostles during the forty days between His Resurrection and the Ascension. Jesus used that time to open the Scriptures to men who could now truly understand them. That is the only explanation for Peter’s deep insight into Psalm 16. He saw that it was a prophetic Messianic psalm written by David, king of Israel, hundreds of years earlier. It actually described Jesus, because it spoke of one whom death could not hold (and Peter helpfully pointed out to the crowd that David’s tomb proved he had died). All the early preaching of the Church to the Jews drew heavily on Old Testament Scriptures. How the apostles savored this joy! Peter wanted the world to know: “God raised this Jesus; of this we are all witnesses. Exalted at the right hand of God, He received the promise of the Holy Spirit from the Father and poured Him forth, as you see and hear” (Acts 2:33). All the promises of God are “yes” in Jesus. Possible response: Lord, Peter helped the Jews understand a new meaning in words of Scripture they had known all their lives. Please give me ears to hear what Your Word is actually saying. This is the psalm Peter used in our first reading to help the Jews understand that the Resurrection of the Messiah was always part of God’s plan: “You will not abandon my soul to the netherworld, nor will You suffer Your faithful one to undergo corruption” (Ps 16:10). At the time David wrote it, he spoke of himself. He was in a difficult situation and expected God to preserve his life. However, Peter helps us see that David was also writing prophetically about one of his descendants, Jesus. Peter could only have learned this from Jesus Himself. Our fuller understanding of the psalms now enables us to see them as primarily prayers of Jesus, the true King of Israel. In this psalm, Jesus delights in God’s care of Him as His Son, trusting God to free Him from death. Now, of course, the psalms become our prayers, too, as members of Christ’s Mystical Body. We, along with David and Jesus, can rejoice over our own escape from death and corruption. Their words become ours: “Lord, You will show us the path of life” (Ps 16:11). Possible response: Lord, sometimes I’m not looking for “the path of life,” because I’m busy following my own path. Help me have eyes to see the way in which I should walk. In the Acts passage, we read a description of Peter’s preaching written by St. Luke. In the epistle, we hear directly from Peter himself. We find once more an emphasis on God’s eternal plan that cannot be thwarted: “[Jesus] was known before the foundation of the world but revealed in the final time for you” (1 Pet 1:20). Can we fathom the meaning of this? “Known before the foundation of the world” takes us way, way back to the beginning of God’s plan. His desire to love and bless us began outside of time and will continue after time has ended. His plan is goodness itself, and nothing in all Creation can derail it. What a help this can be to us, now and always, as we look around and sometimes see only chaos and defeat, as the apostles once did. Jesus has been revealed for us. What should be our response to this great gift from God? “Conduct yourselves with reverence during the time of your sojourning” (1 Pet 1:17). Reverence comes when we truly believe God is present with us, in control of His plan, seeing it through to its glorious end. As Peter says, our “faith and hope are in God” (1 Pet 1:21). Possible response: Father, grant me a proper reverence for You in all the circumstances of my life. Help me stay confident that nothing catches You by surprise.